INTRODUCING: The Hi-Neighbor Homecoming Contest! We’re counting down the days until we start brewing for the first time in the Ocean State since 1982! We’ve been kicking around ideas of ways to show off our new home, but have decided to go with a classic. Golden tickets hidden in candy bars ringing any bells? We’ve hidden 250 golden stickers on 12oz cans that are tucked away in all 12, 18, and 30-packs of Lager. Find a can with a winning sticker? You just won yourself a VIP tour of our new brewery! One grand prize winner, randomly selected from all of the ticket-finders, gets the complete RI/Gansett package! We’ll put you up in a hotel, give you and a friend a VIP tour of the brewery, hell, we’ll even pay for your plane tickets! So while you’re celebrating football season and the holidays, have ‘Gansett. You might just get lucky. Drinking your part, but not finding a stickered can? Text “GANSETTBEER” to 22828 to be entered to win as well! Please see below for the complete official rules and contest information! Good luck! NO PURCHASE NECESSARY. STANDARD TEXT MESSAGING RATES MAY APPLY. SWEEPSTAKES ONLY OPEN TO LEGAL RESIDENTS OF THE U.S. RESIDING IN THE STATES. THROUGHOUT THE SWEEPSTAKES PERIOD AND WHO ARE 21 YEARS OF AGE OR OLDER AT THE TIME OF ENTRY AND MUST HAVE A VALID LEGAL ID. SWEEPSTAKES SHALL BE CONSTRUED AND EVALUATED ACCORDING TO UNITED STATES LAW. DO NOT ENTER THIS SWEEPSTAKES IF YOU ARE NOT A LEGAL U.S. RESIDENT. SWEEPSTAKES BEGINS SEPTEMBER 1, 2016 AT 8:00 A.M. ET AND ENDS February 1, 2017 AT 11:59 P.M. ET (THE “SWEEPSTAKES PERIOD”). VOID WHERE PROHIBITED. HOW TO ENTER: No purchase, and no entry fee, payment or proof-of-purchase necessary to participate in Sweepstakes. Sweepstakes starts September 1, 2016 at 8:00 A.M. ET and ends around February 1, 2017 at 11:59 P.M. ET (the “Sweepstakes Period”). Text the keyword GANSETTBEER to 22828 to enter. You will receive an automated text response from Narragansett Beer confirming your entry. Message and data rates may apply. Some mobile providers may block messaging to short codes. If you are unable to participate via text message, you may enter by visiting www.narragansettbeer.com/text-to-win and filling out the online entry form. Your mobile phone number will be used to select a winner only, and Narragansett Beer will never rent or share your information. NO PURCHASE NECESSARY: All entries become the property of Narragansett Beer and will not be returned to entrant. Every entry submission must be manually keystroked and sent by the individual entrant; automated and/or repetitive electronic submission of entries (including but not limited to entries made using any script, macro, bot or sweepstakes service) will be disqualified and transmissions from these or related mobile number, e-mail or IP addresses may be blocked. WINNING CANS: All participants who discover an official stickered can must email a picture of your stickered can to contact@narragansettbeer.com to claim their prize. Upon emailing, Narragansett Beer will verify the authenticity of the can and will provide further informations regarding your VIP Tour. 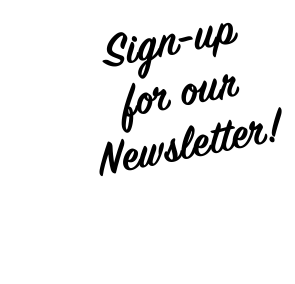 VIP TOUR WINNERS: All winners of the VIP Tour will receive two (2) complementary tours of Narragansett Brewery at The Guild located at 461 Main St. in Pawtucket, RI once its construction has been completed in early 2017. 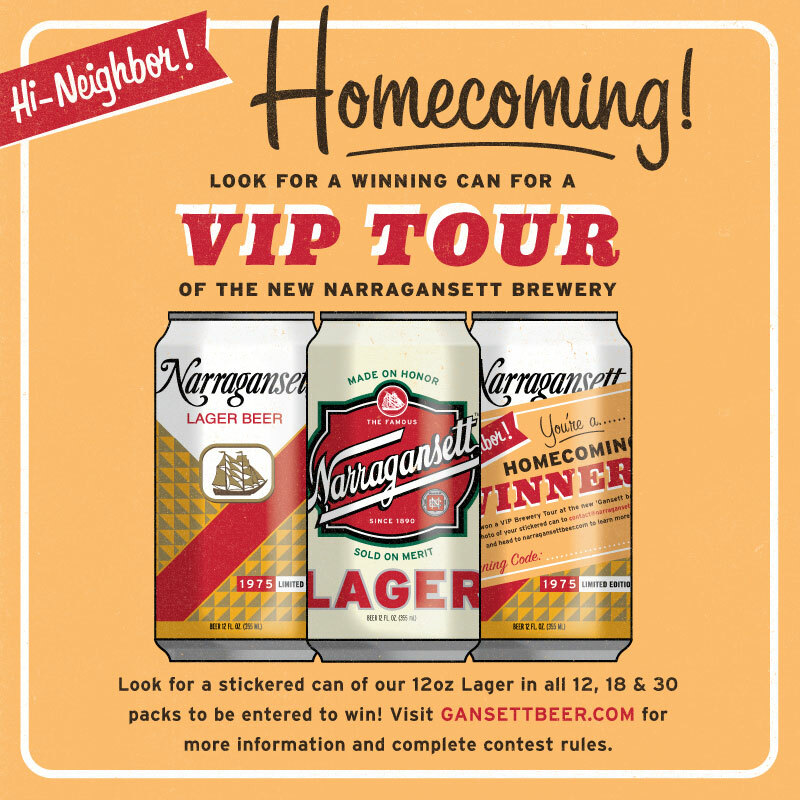 Your VIP Tour will be scheduled in correspondence with contact@narragansettbeer.com. All tour winners are required to provide their own transportation to and from the brewery. VIP Tour Winners are not given complementary airfare or lodging. GRAND­ PRIZE: One (1) Grand Prize will be awarded, consisting of roundtrip airfare for two (2) to Providence, RI on a mutually agreed upon date after the brewery’s official open in early 2017, hotel accommodations, rental car for the duration of the trip, and two (2) complementary VIP Tours of the Narragansett Brewery at The Guild. Grand Prize is non-transferable and no substitution will be made except as provided herein at Narragansett Beer’s sole discretion. Narragansett Beer reserves the right to substitute the prize (or a component thereof) for one of equal or greater value if the designated prize should become unavailable for any reason. Grand Prize Winner and travel companion are responsible for obtaining travel insurance (and all other forms of insurance) at their option and hereby acknowledge that the Sponsor has not and will not obtain or provide travel insurance or any other form of insurance. Grand Prize Winner and travel companion must travel the same itinerary and on the dates and/or times specified by Narragansett Beer or prize will be forfeited in its entirety. Once the travel companion is selected, he/she may not be substituted, except at the Sponsor’s sole discretion. Travel companion of Grand Prize Winner must be at least twenty-one (21) years of age or older, unless accompanied by his/her parent or legal guardian, and must sign a Liability and Publicity Release. If potential Grand Prize Winner’s travel companion fails to return such documents within date and/or time indicated within such documents, then the potential Grand Prize Winner may forfeit the right to the travel companion. DRAWING: The Grand Prize winner will be selected in a random drawing from among all eligible entries received. Drawing will be conducted at random on or about February 1st, 2017. Odds of winning are solely dependent upon the total number of eligible entries received. Mobile and online entries submitted during the Sweepstakes Period are only eligible for this Sweepstakes and do not remain eligible for any subsequent drawings or sweepstakes. Car rental is subject to availability and rental provider’s terms and conditions. Driver must be at least 25 years of age, have a major credit card in their name, valid legal form of identification, and proof of auto insurance. Travel must be round trip. Narragansett Beer will determine airline, flight itinerary, and hotel and rental car accommodations in its sole discretion. No refund or compensation will be made in the event of the cancellation or delay of any flight. Travel and accommodations are subject to availability. Travel is subject to the terms and conditions set forth in this Promotion, and those set forth by Narragansett Beer’s airline carrier of choice as detailed in the passenger ticket contract. ELIGIBILITY: YOU MUST BE A LEGAL U.S. RESIDENT RESIDING IN THE STATE OF CT, MA, RI, NH, VT, or ME THROUGHOUT THE SWEEPSTAKES PERIOD AND 21 YEARS OF AGE OR OLDER AT THE TIME OF ENTRY to be eligible to win. Potential winners may be required to provide proof of legal U.S. residency if requested by Narragansett Beer to determine eligibility and as a condition of prize award. GENERAL: This sweepstakes is subject only to the laws of Rhode Island in the United States. Prize will be awarded and/or delivered only to addresses within the United States. Unclaimed prizes will not be awarded. Except as determined by Narragansett Beer in its sole discretion, no substitution of prize is offered, no transfer of prize to a third party is permitted, and non-cash prizes may not be redeemed for cash value (unless at the sole discretion of Narragansett Beer). Prize winner will be solely responsible for all applicable federal, state and local taxes on prizes. If applicable, winner may receive an IRS Form 1099 for the retail value of the prize. All other expenses on the receipt and use of the prize not specifically mentioned herein are solely the responsibility of the winner. Any portion of a prize not accepted by winner will be forfeited. CONDUCT: By entering this Sweepstakes, entrants agree to be bound by these Official Rules and the decisions of the judges that shall be final and binding in all respects. The Official Rules will be posted on the Web Site throughout the Sweepstakes Period. Failure to comply with these Official Rules may result in disqualification. 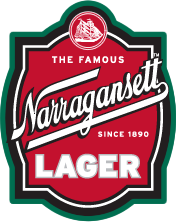 Narragansett Beer reserves the right at its sole discretion to disqualify any individual found to be tampering with the entry process or the operation of the Sweepstakes or the Web Site; or to be acting in any manner deemed by Sponsor to be in violation of the Official Rules; or to be acting in any manner deemed by Narragansett Beer to be unsportsmanlike or disruptive, or with intent to annoy, abuse, threaten or harass any other person. CAUTION: ANY ATTEMPT BY A USER OR ENTRANT OR ANY OTHER INDIVIDUAL TO DELIBERATELY DAMAGE ANY WEB SITE OR UNDERMINE THE LEGITIMATE OPERATION OF THE SWEEPSTAKES IS A VIOLATION OF CRIMINAL AND CIVIL LAWS AND SHOULD SUCH AN ATTEMPT BE MADE, NARRAGANSETT BEER RESERVES THE RIGHT TO SEEK DAMAGES FROM ANY SUCH PERSON TO THE FULLEST EXTENT PERMITTED BY LAW. LIMITATIONS OF LIABILITY: Narragansett Beer assumes no responsibility or liability for (a) any incorrect or inaccurate entry information, or for any faulty or failed electronic data transmissions; (b) any unauthorized access to, or theft, destruction or alteration of entries at any point in the operation of this Sweepstakes; (c) any technical malfunction, failure, error, omission, interruption, deletion, defect, delay in operation or communications line failure, regardless of cause, with regard to any equipment, systems, networks, lines, satellites, servers, computers or providers utilized in any aspect of the operation of the Sweepstakes; (d) inaccessibility or unavailability of the Internet or the Web Site or any combination thereof; (e) any injury or damage to participants or to any other person’s computer which may be related to or resulting from any attempt to participate in the Sweepstakes or download of any materials in the Sweepstakes. If, for any reason, the Sweepstakes is not capable of running as planned for reasons which may include without limitation, infection by computer virus, tampering, unauthorized intervention, fraud, technical failures, or any other causes which may corrupt or affect the administration, security, fairness, integrity or proper conduct of this Sweepstakes, then Narragansett Beer reserves the right at its sole discretion to cancel, terminate, modify or suspend the Sweepstakes in whole or in part. GRAND PRIZE WINNER NOTIFICATION: Potential Grand Prize winner will be notified by mobile number and/or email address provided at the time of entry. Any failure of winner notification will result in prize forfeiture and an alternate winner may be selected. Prize winner may be required to sign and return an Affidavit of Eligibility/ Liability Release with (where lawful) a publicity release within seven (7) days of attempted winner notification as indicated by the date on the Affidavit. Failure to return any required documents within seven (7) days may result in prize forfeiture, and an alternate winner may be selected. WINNER RELEASES: All entrants, as a condition of entry into the Sweepstakes, agree to release Narragansett Beer and Promotion Parties from and against any and all liability, claims or actions of any kind whatsoever for injuries, damages, or losses to persons or property which may be sustained in connection with accessing the Web Site, submitting an entry or otherwise participating in any aspect of the Sweepstakes, the receipt, ownership or use of any prize awarded, or while preparing for, participating in or traveling to or from any prize-related activity or any typographical or other error in these Official Rules or the announcement of offering of any prize. The winner shall bear all risk of loss or damage to their prize after it has been delivered. Narragansett Beer makes no representations or warranties of any kind concerning the appearance, safety or performance of any prize. Except for residents where prohibited by law, winners grant to Sponsor the right to print, publish, broadcast and use worldwide in any media now known or hereinafter known (including without limitation use online at the Web Site) the winner’s name, address, voice, statement, picture or other likeness, without additional compensation, for public relations, advertising and promotional purposes as may be determined by Narragansett Beer.